Previous Story: How To Create Music? "It is believed," Hosh continued, "that sound was there in the beginning, when there was nothing else. It existed by itself." "How it could have been produced without something striking another is still a mystery to me though." "You see, any sound you hear is made up of vibrations. These vibrations are energy that radiate outward from the vibrating source in all directions." "Imagine a stone thrown into a still body of water. The rings of waves expand outwards indefinitely. That's what happens with sound." "A vibrating object compresses the molecules surrounding it by squeezing them closer together. It then rarefies them by pulling them further apart." "Say a stereo speaker was vibrating. Although fluctuations in air pressure travel outward from the vibrating speakers, it is the energy that travels away from the speakers and not the matter itself." "Matter?" asked Josh, "You mean solid, liquid or gas." "Yea," answered Hosh, "So, the stereo vibrations don't actually send the air surrounding the speakers towards our ears." "The air molecules surrounding the speakers generally stay where they are, even though they do get agitated by the vibrating speakers." "When they begin to vibrate too because of the vibrations of the speaker, they bump into other air molecules close to them. This makes them vibrate too, causing them to bump into more air molecules further away from the speakers. This movement, called sound waves, keeps going until it runs out of energy." "Then how do we hear sound?" asked Josh. "Human ears are remarkably sensitive to vibrations in the air. We hear sounds whenever our ears are within range of these vibrations." "The changes in air pressure vibrate our sensitive eardrum. This sends nerve signals to our brain, which our brain interprets as sound." "When the vibrations are fast, you hear a high note. When the vibrations are slow, we hear a low note." "Humans can hear sounds as low as 20 microPascals (μP). That is an extremely small amount of atmospheric pressure. Cats can hear sounds even lower than that." "The loudest sound a person can bear to hear without pain or ear damage is about 200,000,000 μP. That's more than a jet airplane taking off nearby. Dogs can hear sounds even louder than that." "Because the human ear can handle such a large range of intensities, measuring sound pressure levels on a linear scale becomes quite inconvenient. For example, if the range of human hearing were measured on a ruler, the scale would go from 1 foot (quietest) to over 3000 miles (loudest)!" "To make this huge range of numbers easier to work with, a logarithmic unit, called Decibel, is used. Logarithms map exponential values to a linear scale." "For example, by taking the base-ten logarithm of 10 (101) and 1,000,000,000 (109), this large range of numbers can be written simply as 1–9, which is a much more convenient scale." "A Decibel is one-tenth of the actual unit 'bel', which was named after the telephone inventor Alexander Graham Bell. The decibel measures sound pressure or electrical pressure (voltage) levels." "The threshold of hearing (TOH) is assigned a sound level of 0 decibels (abbreviated 0 dB). This is the quietest sound we can hear and it is at an intensity of 1*10-12 Watt/square metre." "Rustling of leaves, which is a 10 dB sound, is about 10 times more intense than TOH ( 1*10-11 W/m2). A whisper, which is a 20 dB sound, is about 10x10 or 100 times more intense (1*10-10 W/m2) than TOH, or 10 times more intense than the rustling of leaves." "Now 10dB = 1B (bel), as decibel was a tenth of Bel. Similarly 20dB is 2B. So a whisper at 2 bel is 10 times louder than rustling of leaves at 1B. This means that for every additional bel on the scale, the signal represented is ten times stronger than before." "Similarly, a sound that is 10x10x10 or 1,000 times louder than TOH (1*10-9 W/m2) is assigned a sound level of 30 dB. 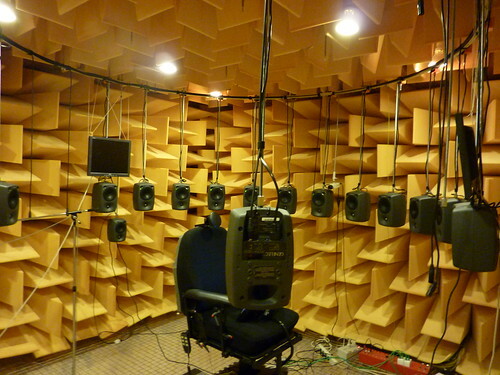 A sound that is 10x10x10x10 or 10,000 times louder (1*10-8 W/m2) is assigned a sound level of 40 dB." "To give you a better understanding, normal human conversation happens at 60dB. Can you tell me how much louder that is compared with the quietest sound we can hear?" "10 to the power of six, so a million times louder!" Josh tried, "But that can't be possible. Is it really that much louder?" "Numbers don't lie," Hosh nodded solemnly, waiting for this information to sink in. "A rock concert," he continued, "is a billion times louder than a whisper. Prolonged exposure to such noise levels can't be good for us, can it?" "Our brain uses a lot of its computing power to make sense of these auditory signals, and to cut out the extra noise. Even when it seems quiet, the softly humming Fridge, the overhead light, the Walkman playing silently in the background etc. can be giving out 30-60dB for us to process." "That is why, our decision making and productivity goes down heaps in loud offices and noisy environments. That is why it is not good to have loud music in the background when you are studying, working or shopping." "This is also the reason why people drink more in noisy pubs and discoes and then make stupid decisions there. Because their brain gets too overloaded. It simply can't think properly in all that din. And when you drink there, it gets even worse. The dumbest chick starts looking like Aphrodite." "A busy street traffic is around 70dB, front row of a Rock Concert is exposed to 110dB, sound becomes painful at 130dB, and 160dB will cause instant perforation of our eardrums."